If you could have set up a perfect finale to the North Group of the One-Day Cup, this would have been it. Five teams can qualify, four of whom are playing each other, both of which are derby matches. This does create serious problems, as trying to decipher what each team needs to do to progress is a serious headscratcher. For Warwickshire, Worcestershire, Yorkshire, Nottinghamshire and Derbyshire it’s win and you are through, lose and there will be no trip to Lords this year. Of course it never quite works out that simply but there is nothing to fear though, as we at Deep Extra Cover, as with the South Group, have got you covered on how your team can qualify. As you are reading this we may already know from the South who has joined Hampshire and Kent in the knockout stages, but who will play them? Your definitive guide to the final round of the North Group is right here. It is important to remember that if teams finish on the same number of points it comes down to number of wins first and then run rate second. The group leaders head to Edgbaston for what is sure to be a mouth-watering West Midland’s derby, but it is a trip fraught with danger. Though there will be little fear amongst a side that has got used to winning in this competition, Worcestershire topped the North Group last year and five wins so far in 2018 has put them in good stead to do so again. Their batting has been particularly impressive, passing 300 with regularity in this year’s tournament. Victory against their rivals and a home semi-finals is theirs, but if they fail to do so then they may not qualify at all. Defeat at Edgbaston means if Yorkshire and Nottinghamshire both win, then they are out of the tournament completely. If Derbyshire were to beat Nottinghamshire, then they could still stay in the competition but this would be unlikely due to both teams run rate being similar. The Yorkshire result is the important one, as if they cannot beat Northants at Headingley, then even if Worcestershire lose to Warwickshire then they will still go through. An abandonment at Edgbaston, which does seem unlikely due to the weather forecast, would be enough for qualification as it would mean they would definitely finish above Warwickshire and Derbyshire leaving only Yorkshire and Nottinghamshire able to leapfrog them at the top of the table. An opening-day defeat to Derbyshire was the worst possible start to the Bears’ white-ball season but they are unbeaten since. Sam Hain, Ian Bell and Jonathan Trott have all been excellent with the bat, and Jeetan Patel has led the side well in the field. They demolished Leicestershire on Sunday and, like their opponents on Thursday, know a win will see them top the group. Though if they are defeated their fate is in the hands of Yorkshire, who will put them out of the competition if they beat Northants. Both Nottinghamshire and Derbyshire will move above Warwickshire in the table whichever one of them wins their clash at Trent Bridge. The latter would join the Bears on ten points but move above them on matches won. So the real emphasis is on the Yorkshire match. The abandonment that would see Worcestershire through, would not do the same for Warwickshire as if Nottinghamshire and Yorkshire win they would be out of the tournament they won back in 2016. It will probably not end up as easy as this due to run rate and differences on number of wins but in simple terms for both Warwickshire and Worcestershire, the loser will be out if Yorkshire win, but will finish third if they do not. Three wins on the spin has put Yorkshire in with a great chance of reaching the knockout-stages, with their fate firmly in their own hands. 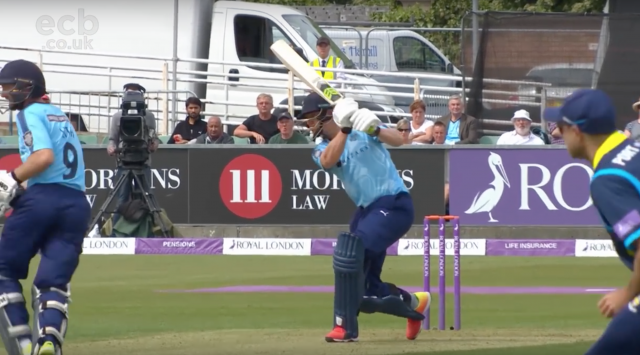 Their last match against Lancashire was an enthralling encounter in which they amassed 379 runs mainly due to a 235-run partnership between David Willey and Adam Lyth, both of whom scored hundreds. A win against Northants will see them secure a home play-off match unless Nottinghamshire also win but by a much bigger margin which would mean an away trip in the knockout stages. In the event of an abandonment at Edgbaston, Yorkshire would probably top the group due to their superior run rate over Worcestershire and having won more matches than Warwickshire. Again though, only if they win on Thursday. Defeat at Headingley, then they are out of the competition, no matter what happens elsewhere. A result no doubt both Warwickshire and Worcestershire will be hoping for. Last year’s champions won the tournament after finishing third in the North Group and they will probably have to do it the hard way again this year. As with most of the sides competing for qualification, it is pretty much win or bust for the Outlaws. Victory over rivals Derbyshire will secure qualification, in either second, if Yorkshire lose, or third if they beat Northants. As mentioned earlier, they could still finish above Yorkshire if they both win but would have to overturn a run rate deficit of about 0.5. Defeat means that the Outlaws are out, and if their match is abandoned they qualify if Yorkshire lose. The equation for Derbyshire is a very simple one. If they are to progress, they have got to beat Nottinghamshire first and foremost. Then they need at least one result to go their way. They either need Yorkshire not to beat Northants, Warwickshire to lose or Worcestershire to lose by enough that it helps Derbyshire overturn the run rate between the sides. Any of those results alongside a Derbyshire win and then the Falcons would be through. This would probably be in third but finishing second is also possible, but the only chance of that happening is if Yorkshire lose. An abandonment at Edgbaston is one thing that Derbyshire will not want, as it takes both sides involved in that game out of their reach with them then relying entirely on the result at Headingley. Lancashire will probably feel it’s a case of what might have been in this tournament. They have played some excellent cricket at times, but have perhaps lost a few matches they should have won. Their opening defeat to Nottinghamshire an example, a game in which they were well placed to chase down the 319 required to win but fell away in the last ten overs. After their thrilling loss to Yorkshire, Lancashire have now played all of their matches and will likely have to make do with finishing sixth. Dropping to seventh is also possible but only if Northants comfortably beat Yorkshire. The 2016 T20 champions will be disappointed with their efforts after a good start to the tournament. Two wins from three meant they were in a good position, but a no result against Warwickshire is the only point they have picked up since. A win over Yorkshire could see them overtake Lancashire in sixth, but it would have to be by a hefty margin due to their poor run rate. A drop to eighth is also possible if they do not win at Headingley and Durham can see off Leicestershire. Three damaging defeats early on in this competition pretty much put paid to Durham’s hopes of progressing out of the group stages but wins over Worcestershire and Northants did provide some rest bite in what has been a difficult season for the county so far. Spirited efforts against Warwickshire and Nottinghamshire have followed but these were in vain. Victory over Leicestershire and if Northants cannot beat Yorkshire will see them into seventh in the table. A loss and it’s the wooden spoon in the North Group. Just about nothing has gone right during this competition for Leicestershire. The win over Northants in their first match seems a distant memory, and their performance against Warwickshire in their last match was from a side who looked beaten before they had turned up. Michael Carberry has been removed as captain during the tournament but that has done little to improve their fortunes. A win over Durham may at least provide some comfort as it will mean they do not finish bottom of the table.